Come to Mahal and enjoy the ultimate experience in fine Indian dining. 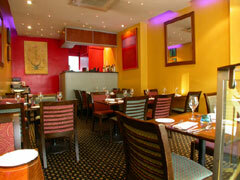 This attractive restaurant is set on two floors and has a relaxed and friendly atmosphere. The decor is modern with walls painted in warm earth colours and decorated with Rothko-style paintings. This restaurant gives all Indian food lovers the chance to enjoy the genuine flavours of the east. Located a stone’s throw from the Notting Hill Gate tube station, Mahal has been serving the people of West London with superb traditional Indian Cuisine for over 35 years. A banquet of traditional Indian dishes from the regions, as well as a superb selection of upmarket dishes with many vegetarian choices awaits you. And if you don’t find it in the menu, the chef is happy to prepare your requested dish. The intimate private room in this restaurant makes a suitable venue for most parties. The whole restaurant can cater for private parties of up to 80 guests on request. Mahal also offers take away and home delivery service for those occasions that you are glued to the couch. The menu is innovative with many unique creations as well as a selection of both traditional dishes and house specialities. The philosophy here is to offer spice, flavour and freshness using only the finest ingredients. All meals are cooked to order each with its own individual flavour.